Inquiring minds want to know: is there an Indian version of/remake of/homage to Star Wars? If so, does Helen play Leia? If not, feel free to write in your suggested cast, director, and composer (we don't really want to trust John Williams with this project, do we?). FYI, a teaser for upcoming events: continuing on the express to Shashi Pradesh, Ajooba is tonight's viewing pleasure and Prem Patra is lined up for Saturday. The following weekend, the train will take a slight Shashitabh-inspired detour when Aspi and I go to the Chicago leg of the Unforgettable Tour. Tour prep includes: choosing outfit (something to complement Ritesh's red pleather, perhaps? definitely must allow for dancing), figuring out how to smuggle in a camera, and listening to Kamla's new interview with Abhishek. Update to post: well well well, look what just came up in a search for something almost entirely unrelated. AHAHAHAHAH!!! I'm gonna call him the Paindoo Menace from now on. As for smuggling in a camera, choose one that doesn't have lights that go on when you turn it on and disable the flash. I used to work in a theater and little red lights and flashes were how we caught the evil doers. I'm so sick of Bacchan. If they had made an Indian Star Wars in his life time, I think it would have been an insult not to give the role of Darth Vader to Amrish Puri -- only they would have had to cut a hole in his mask so that you could see his eyebrows. LOL Paindoo Menace! Yesssss. 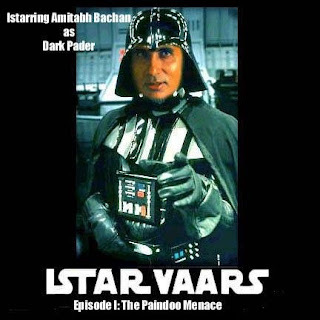 I think Amitabh is the perfect choice for Darth Vader both physically and vocally. Shahid Kapoor should have Luke's character, Kareena can play Princess Leia (they don't have many scenes together in Episode 3 so it's hopefully work out), and Akshay Kumar would be a good Han Solo. Or maybe Abhi. Naseeruddin Shah can be Obi-Wan. And Aish can play C-3PO. Okay. I just spent way too long mentally casting it. But hey, enjoy Ajooba and Prem Patra! If there were justice in this world, Leia would be played by Tanushree Dutta. Alas Yunus Pervez is no more - otherwise I'd cast him as Yoda. Both have been done before quite a bit (not by me of course). I'd be amazed if Koi Mil Gaya didn't rip off SOMEthing from Star Wars, although I'm not about to sit through it again to find out. If this was the 70s, Princess leia would be Pravin babi- or Zeenat. Luke= Shashi, and Dharam or Vinod Khanna as Solo! Thanks for the light tip. I will be as stealthy as possible! Todd - Space: the final frontier? And I agree re: Amrish. It must be done. ajnabi - Apparently I was making this movie in the 70s, so your current-day cast caught me off guard. :) I would love to see Kareena in the Leia hair-do, that's for sure. I really, really like the idea of Abhishek playing the space cowboy, Harrison Ford-inherited role. Aspi - That's a weird sense of justice you have. But I like your idea for Yoda. And I'm down with option 2. Sweet! memsaab - Aw, I heart KMG. I don't recall any Star Wars moments in it, but I'm not particularly well-versed in Star Wars to begin with. Shweta - Yeah! Yeah! Yeah! Vinod Khanna would make a great Han Solo! Been lurking at your awesome blog for awhile now. I live in SF and saw the concert Sunday - almost everyone around me managed to get a camera in. Ours was in a pair of binoculars as we were sitting in the last row but pics came out terrible so I wouldn't recommend. Show was sadly flat - probably worst one I've ever attended and I'd been looking so forward to it. Choreography not very good, most performers on autopilot, lacked a master of ceremony. Not sure if they were sick (I'd read Amitiji was), tired (they performed the night b4 in LA), or just hadn't practiced enough but I swear you could practically see them counting steps. Hope they improve by the time your show happens. As for casting I think Saif has the perfect acerbic humor to play Hans, Leah has to be Kareena, Shahid may be the only one boyish/simple enough to play Luke, and I too like the Big B as DV. Ash as C3PO is too friggin funny! Hey Jennifer, thanks for piping up :) That's really too bad about your show - I'm sorry to hear it was such a dud! I've only seen the Heat show in 2006, so I don't have much to compare too. In that one, I thought Preity was by far the best, so I'm looking forward to seeing her again. Good point on Saif's humor! I can definitely imagine him delivering those lines with the proper zip. Beth - "paindoo" is slang in India/Pak (Punjabi in origin I think) for "hick". Ergo: Istar Vaars for Star Wars. For eg, Anil Kapoor in Tashan was a paindoo menace. Oh I love it! Must commit to memory immediately.